The OpenEEmeter calculates changes in energy use by comparing a building's energy consumption, before and after an energy efficiency retrofit or electrification upgrade. 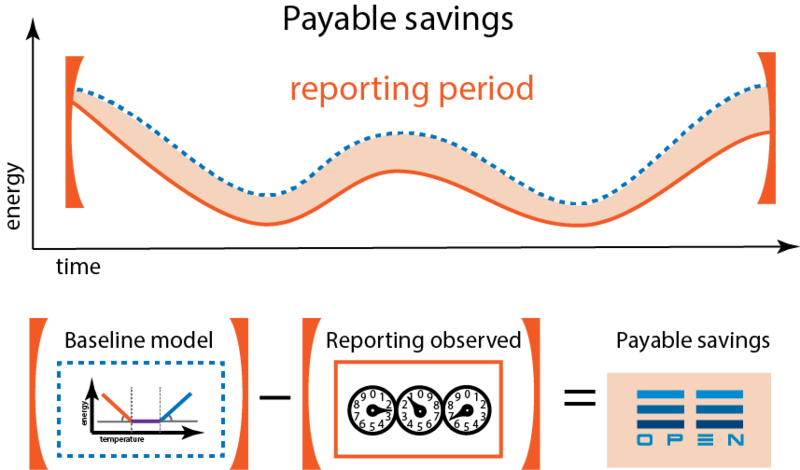 Baseline and reporting periods are defined by the endpoints of the project period. The central question in measuring energy efficiency: how did energy consumption change from the baseline period to the reporting period? Energy data is loaded into the OpenEEMeter as a “trace”, a single-dimensional time series of measurements tracked by a single physical meter or smart meter. For instance, many projects are broken into two traces: one natural gas trace, and one electricity trace. 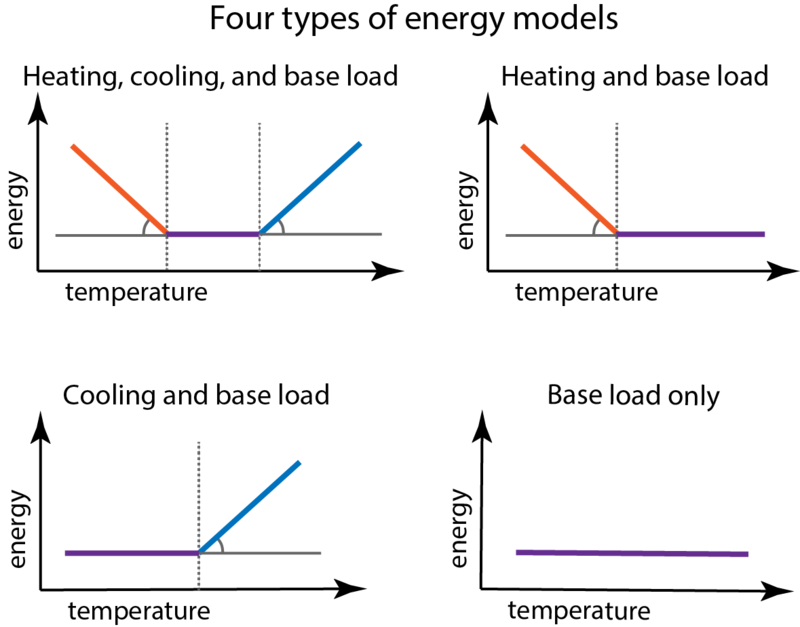 A single project can have multiple traces, each of which is a single time-series of energy measurement. Address or ZIP code: Used for matching the project to nearby weather stations in the same climate zone. Project start and end dates: Used for splitting traces into baseline and reporting periods. Building energy usage can be organized into three categories: heating load, cooling load and base load. During cold weather conditions, a building needs to be heated to achieve a comfortable temperature; similarly, hot conditions require cooling. Other elements, such as refrigeration and lighting, remain more consistent over the course of the year and can be represented in the base load. Building energy consumption broken into base, cooling, and heating loads. The relationship between energy use and temperature is reflected in the building consumption profile shown below. Heavier use occurs during periods of high and low temperatures (summer and winter) while usage during more temperate periods (spring/fall) is more moderate. 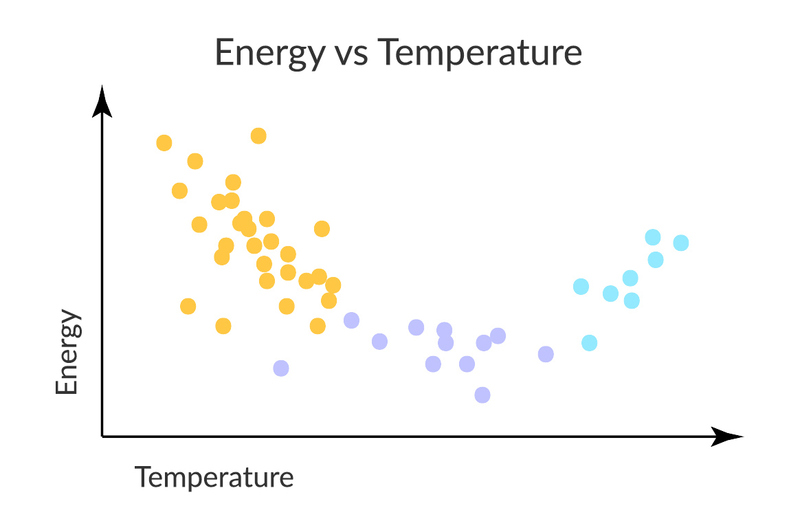 Building energy consumption plotted against external temperature. The OpenEEMeter fits a linear model to this data and can use this model to estimate the building’s energy consumption, given outdoor weather conditions. Model suggested by pattern of building energy consumption. 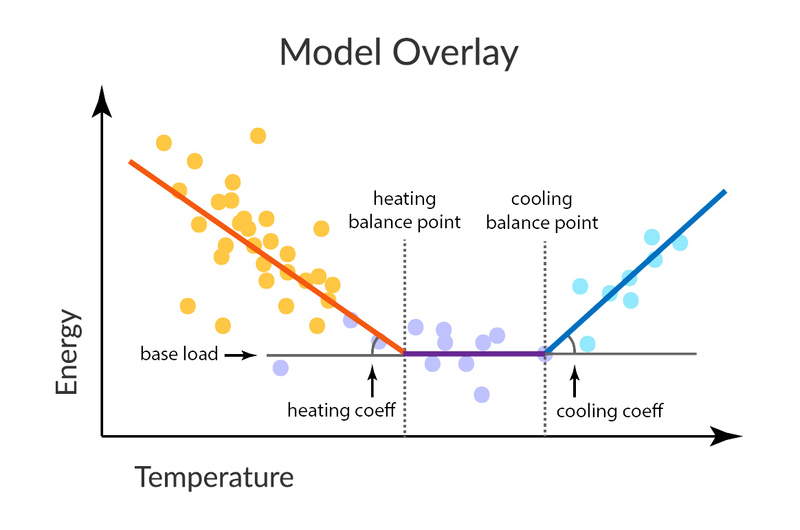 Depending on the fuel a building uses for heating or cooling, models with a single temperature coefficient (i.e., heating or cooling) may be more appropriate. The OpenEEmeter fits four types of models to the data, scores the model fits, and chooses the best candidate model. For more information on the fitting procedure and the exact model construction, see our additional documentation as well as the Github code. The OpenEEmeter also calculates a number of standard outputs, which can be used to perform additional analytics tasks. Payable savings represent actual savings observed since project completion. Payable savings represent the total energy reduction associated with an energy efficiency project. Payable savings are calculated by first using consumption and weather data from the baseline period to establish what consumption during the reporting period would have been in the absence of an intervention. The actual energy usage during the reporting period is then subtracted from this counterfactual (what consumption would have been) to yield payable savings. Payable savings can be used as the performance metric in pay-for-performance settings and can also provide readily available feedback with respect to the savings yields of energy efficiency projects. Normal Year savings represent hypothetical savings that would be observed in a "typical" meteorological year. Another way to quantify energy efficiency savings is "normal year savings." This is the expected annual savings over a “normal” weather year. 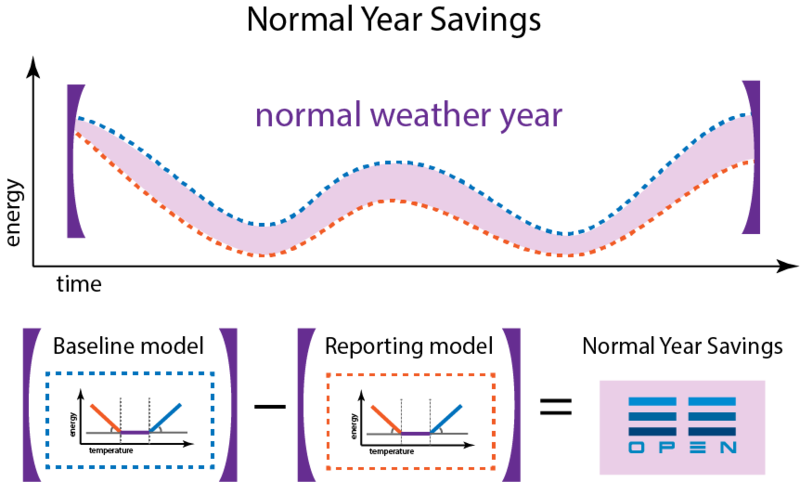 The “normal” weather year is an idealized, hypothetical year which is constructed by drawing from observed weather data. This effectively “normalizes” the data by removing some weather uncertainty, and allows for comparison over a number of years. Was this guide useful to you? Did anything need more explanation? Please let us know.